San Diego, CA, December 14, 2015 — /EPR NETWORK/ — Have you ever had the issue of looking for a specific photo and can’t find it? You thumb scroll endlessly but there’s no effective way to sift through all those photos every time you’re looking for something specific. OurHive™ is the newest family app that combines patented technology and a private family network to deal with this growing issue of digital overload. The app is now live on Google Play, the App Store and as a Web App at www.GetOurHive.com. 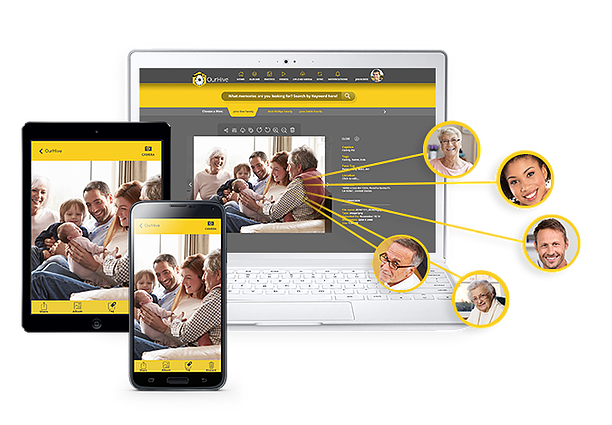 OurHive combines the best features of a photo and video application with a private social network created especially for families. With the OurHive app, family photos and videos can be automatically tagged, organized and instantly shared with only the people you care most about. Once a private Hive is created, family members can upload and share photos and videos with each other using their iPhones, iPads, Android phones, tablets, laptops or desktop computers. All files are archived in high resolution and can be viewed and downloaded anytime. Photo and video sharing within mass-market social networks can sometimes be compromised by unauthorized use and manipulation of media. Special attention has been made with OurHive’s cloud interface to ensure the best security. Photos and videos are encrypted every step in the journey from devices to OurHive servers and back again, and the content can only be accessed by invited, password-protected members. Because archiving and tracking family photo albums is important, the OurHive app was designed to make tagging and organization simple and accessible. Every photo and video you take with the iOS or Android app ‘automagically’ adds a caption and location from your calendar, along with the closest address when GPS is enabled. You can then edit the filename, add tags and captions and give your photos the same context that writing on the back in ink used to for print photographs. Starting your own Hive begins with one family member starting a free 20GB Family Hive by visiting GetOurHive.com or downloading the “OurHive” app on Google Play and the App Store. They can then invite as many family members or close friends as they want into their secure, private Hive. Each user can then download the free app on the iOS or Android device of their choice and start contributing and sharing family memories. OurHive™ automatically stores your photos and videos in high resolution in your own private network. Anyone in your family Hive can download anytime they want and future updates will allow for even more functionality.